Baked River Pike with potatoes on a cream mushroom sauce. Pelmini (with sour cream sauce) and a Georgian red! 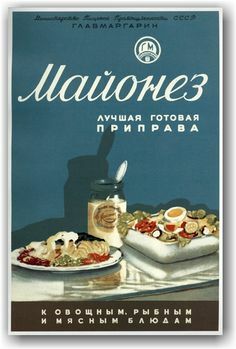 The traditions of modern Russian cuisine is still closely connected with the types of food that the ‘peasants’ cooked during the time of the Russian Empire. Basic dishes haven't changed. However, nowadays when people are in a hurry and don't have enough time to cook at home, they prefer fast food, cafes, etc. Nevertheless, food and beverages that are served at home are almost the same as they were several hundred years ago. Russian people are very hospitable. 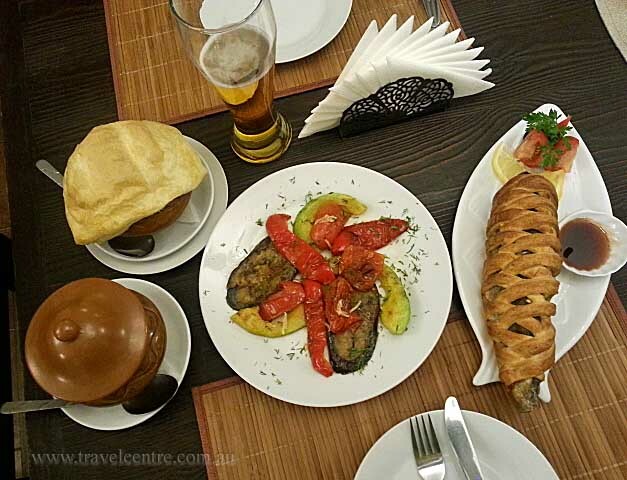 When you travel Russia you will experience the range food and beverages on offer, especially during holidays and festivals of Russia. Usually, there are three main meal times: breakfast, lunch, and dinner. Main courses are served at lunch and dinner. 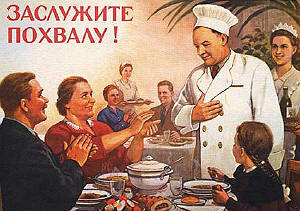 Meals first include soups and it's impossible to imagine a Russian dinner without them. There are different varieties of soups: “shchi” (cabbages with meat), “rassolnik” (hot soup of pickled cucumbers), “ukha” (boiled fish), “okroshka” (the ingredients aren't boiled but put in kvas or sour milk; it is usually made in summer), “kasha” (porridge) it's prepared from any grain (buckwheat, rice, wheat). Most soups are served with “smetana” (sour cream). Though Russia is a large country, these soups can be easily found almost in every corner. Potato, carrot, beetroot and herring salad!! Other popular dishes are made from meat (sausages, pelmeni, chops, steak) and of course potatoes. 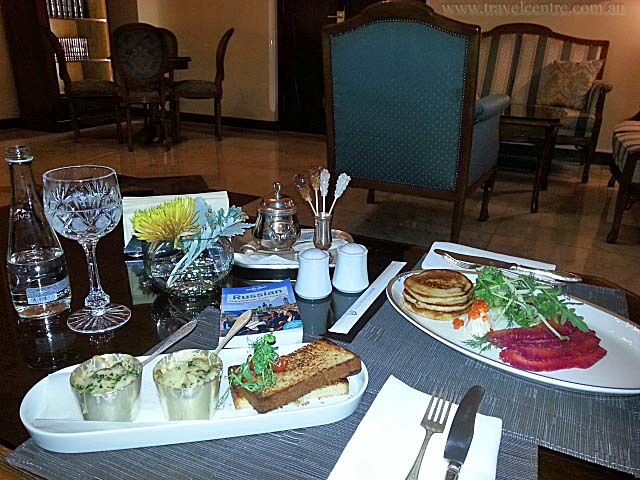 There are also different salads made from seasonal vegetables and fruit. 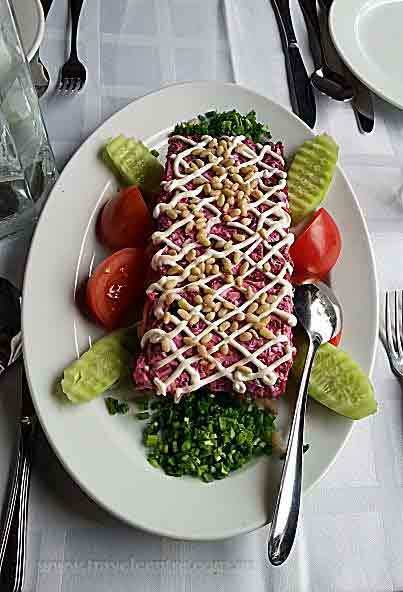 One should never forget that most food is served with bread as this is the most essential thing in Russian cuisine. In Russia, people drink tea and coffee for pleasure as other nations do. Amongst traditional alcoholic free beverages there are prostokvasha, kvas, and kompot (stewed fruit). Amongst alcoholic drinks, vodka and samogon are the most well known. 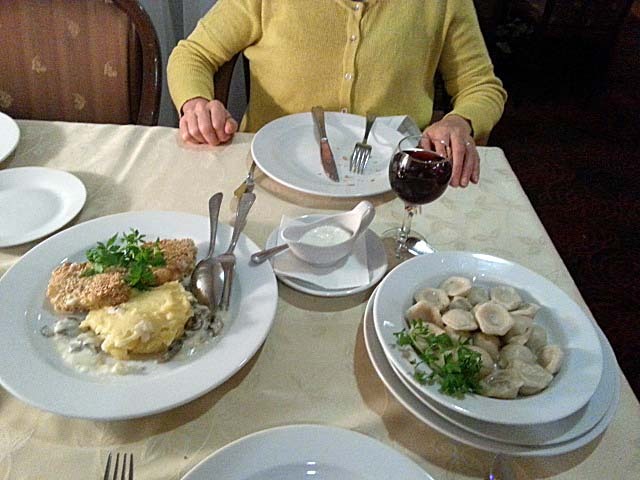 Beautiful meal in Suzdal featuring ' stuffed trout baked in basket'. Amazed to see what a 'basket' was! 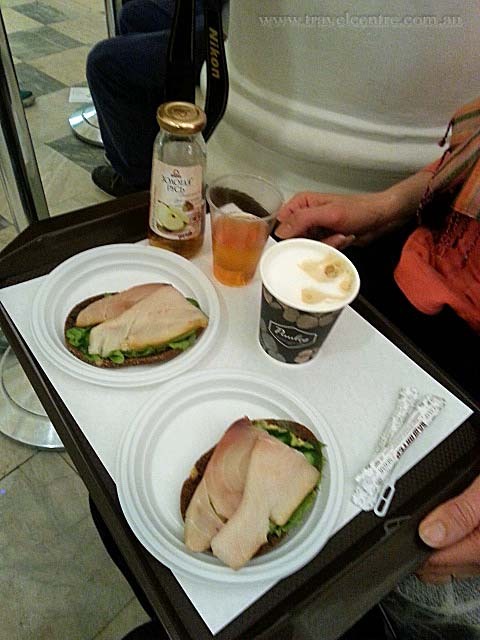 Hermitage museum cafe snack. Pickled white fish on black bread with avocado. Fruit juice and coffee. Oct 2014 = Roubles 540. Good value considering the location! 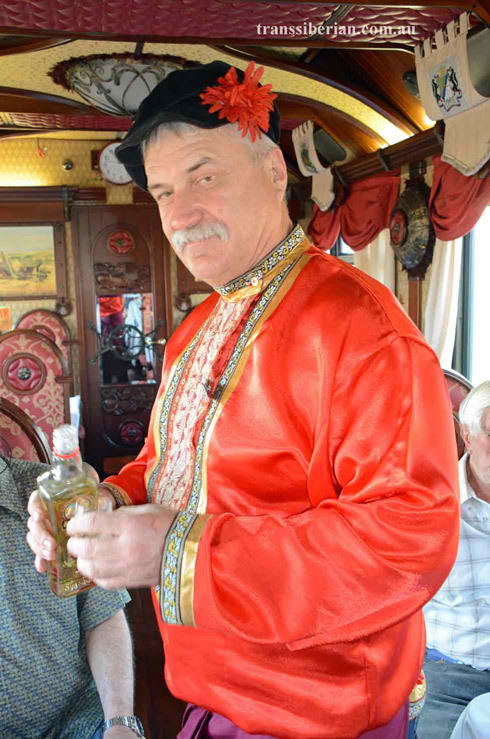 One of the chefs on our private Trans Mongolian train tour. 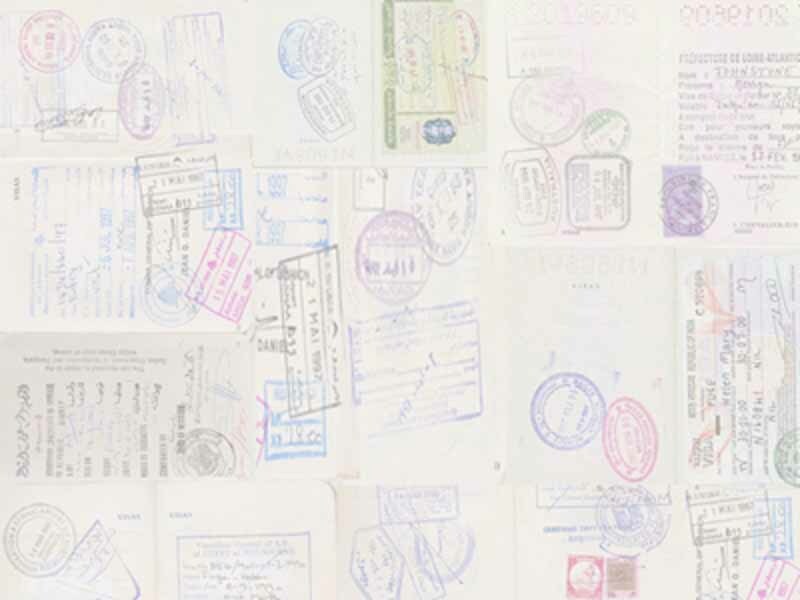 Does the name Prince Alexander Borisovich Kourakine mean anything to you? The world of food lovers and restaurants have to thank this man for a major change in the way we ate food. He was the Imperial Russian Ambassador to Paris during the late 19th century and introduced to the west the Russian tradition of serving food dishes one at a time. This service became known as 'a la russe' and before its introduction all food was usually put on the table in 3 serves - no matter what the quantity or variety of courses.